We don't have too many party games in our game collection as we tend to focus on games that provide more challenge, which typically means smaller groups of players. And it's not like we don't like party games but we don't often have parties with large numbers of gamers nor do we find ourselves juggling more than 6 players for practical reasons. 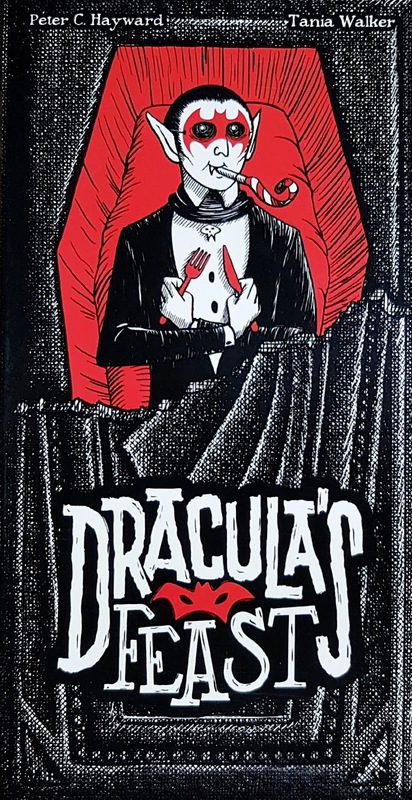 Dracula's Feast is an unusual addition to our collection that we learned about through a friend. It's not exactly as crazy as some party games that can support 20+ players but a max player count of 10 is pretty impressive. Plus the game still provides a fair amount of challenge, doesn't involve player elimination and is still a heck of a lot of fun. Not only is this is a party game but it's also a deduction game with a bit of bluffing thrown into the mix of things. I'm glad that our friend had an extra copy as she had supported the initial Kickstarter as it's not exactly a game that we've ever seen at retail locations just yet. It's fast and fun and you may even get a little dancing in as well. 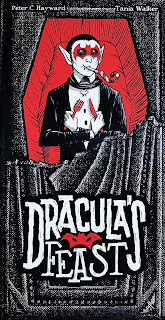 Synopsis: Dracula's Feast is hidden roles game created by Peter C. Hayward with delightful art by Tania Walker. The game supports 3-10 players and a round can be resolved within 15 minutes. Dracula has thrown a masquerade ball and everyone in the town has been invited. But some monsters have crashed the party in different disguises and things seem ready to go wrong for any number of reasons. In the game players portray these different monstrous ball guests and one will need to figure out who everyone is in order to win the game. Each player has unique rules that apply to them whether in terms of what they can do or even how they can win the game. During a player turn everyone gets one action only. First there's the Query where you flat out ask another player if they're Dracula or even Van Helsing and they pass a whisper card saying Yes or No in response. Then you can ask people to Dance and when you do this you step away from the table and share your respective roles with one another. Finally you reveal yourself and Accuse the other players by taking the public role cards and assigning one to each player and the Mystery Guest at the center. If you're right then the game is over. If you're wrong things continue with your role open to everyone. Things That I Liked: This game is amazingly clever in terms of its rule tied with the unique abilities of every character role. Some are unable to refuse invitations to dance. Others always answer Queries with "Yes" no matter what the truth is. And some have special win conditions like a need to find Dracula alone and no one else. And how those different quirks play together are what define the unique challenge of every round. And the odd thematic nature of the game being a party and one of your actions being a dance is just silly fun. So naturally we play things up by playing the Monster Mash while playing and implementing a house rule that players actually need to dance a bit. Sure it's not an official rule but the whole nature of the game and the humor at play is what enabled it and got players in the right mindset. And you have to appreciate games that manage to achieve this. Things That Could Have Been Better: With some repetition, the game can get a little dry especially when the same characters keep coming up. And you'll be itching to vary the game even more. There's an expansion Cthulhu & Friends that was also made available during the Kickstarter and I can only hope that if you find a copy of this game you also make sure to get the expansion right away. And there's definitely a rather asymmetric nature to the game which may frustrate some. This is particularly true for roles that come with alternate win conditions as it can seem like the game is a lot easier for them versus everyone else. The fact that Van Helsing only needs to identify Dracula isn't quite as fun as clever twists like how Alucard wins if someone mistakenly accuses him of being Dracula. It comes and goes but you'll still have fun somehow. TL;DR: Dracula's Feast is a clever party game that is a smarter choice versus other games in the genre. The diversity of play and the new combinations that can come up make each game unique, memorable and of course fun. And thus the game gets a full 5 monstrous dances out of a possible 5.